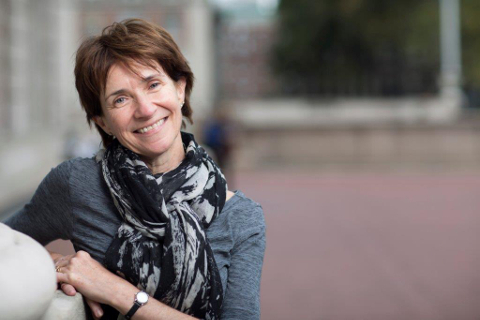 Eileen Gillooly is Executive Director of the Society of Fellows and Heyman Center for the Humanities and Adjunct Associate Professor of English and Comparative Literature and the Institute for Research on Women, Gender, and Sexuality. Gillooly has a BA from Scripps College and a PhD from Columbia University. Her interests include nineteenth-century literature and culture in Britain and its colonies, gender studies, public humanities, justice studies, medical and health humanities, and literary and social theory. She is the author of Smile of Discontent: Humor, Gender, and Nineteenth-Century British Fiction (University of Chicago Press, 1999), which was awarded the Perkins Prize by the International Society for the Study of Narrative in 2001, and the contributing co-editor of Victorian Prism: Refractions of the Crystal Palace (University of Virginia Press, 2007) and Contemporary Dickens (Ohio State University Press, 2009; paperback 2016)). Ongoing projects include a digital online facsimile edition of David Copperfield in parts and a monograph about middle-class parental feeling in nineteenth-century England. She has been awarded research fellowships by the American Council of Learned Societies, the National Endowment for the Humanities, the National Humanities Center, the Woodrow Wilson Foundation, the Whiting Foundation, St. Deiniol’s Library (UK), and the Moore Institute at the National University of Ireland, Galway. She is currently a co-principal investigator on the Justice-in-Education grant, awarded by the Andrew W. Mellon Foundation (2015-2018).